Welcome to our last challenge of 2014. We have picked a nice easy one this time around, Christmas. I am sure you all still have those last minute cards to get done so we look forward to being amazed at your fabulous creations. I am hosting this one. Well you can't dump all the work on your team at Christmas even if you want to! Before we get on with the sponsors and the DT inspiration, sadly we are losing a couple of members of our team after this challenge, so this challenge will serve as a DT call as well. If you think you might be interested in joining us please add DT after your name in the linky list. We're a very laid back team, and I am sure you will have fun if you join us! 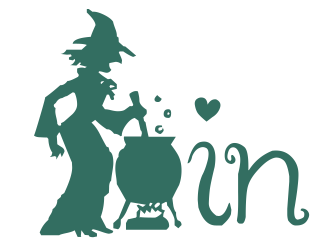 If you want to join us, but don’t want to enter the challenge just drop me an email at the address in the sidebar with a link to your blog. I would like to thank Suze and Viv for all their hard work. I'm hoping Viv might still be able to join in with the team with the odd challenge when she can find time, but she has an exciting year ahead, so I wish her every success with her plans, and Suze has a busy year planned as well, and I wish her well too. We have two sponsors for this our last challenge of the year. It will run for three weeks closing on 28th December, but we will not be back until January 12th with our first challenge of 2015. I may or may not announce the winners before the New Year, depending on how busy I end up being and how much last minute Christmas stuff I still have to do! 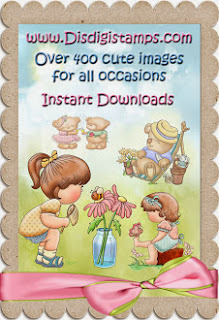 My image is from Rubber Stampede and embossing folder from Spellbinders. 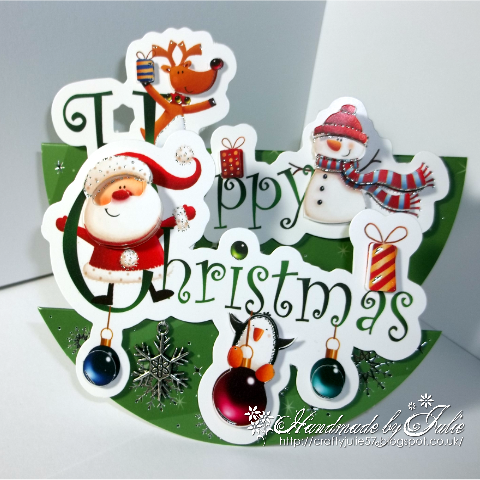 A nice traditional looking Santa and a simple embossed background. For this card, I kept the design simple and just let the gorgeous card and die cuts take centre-stage. 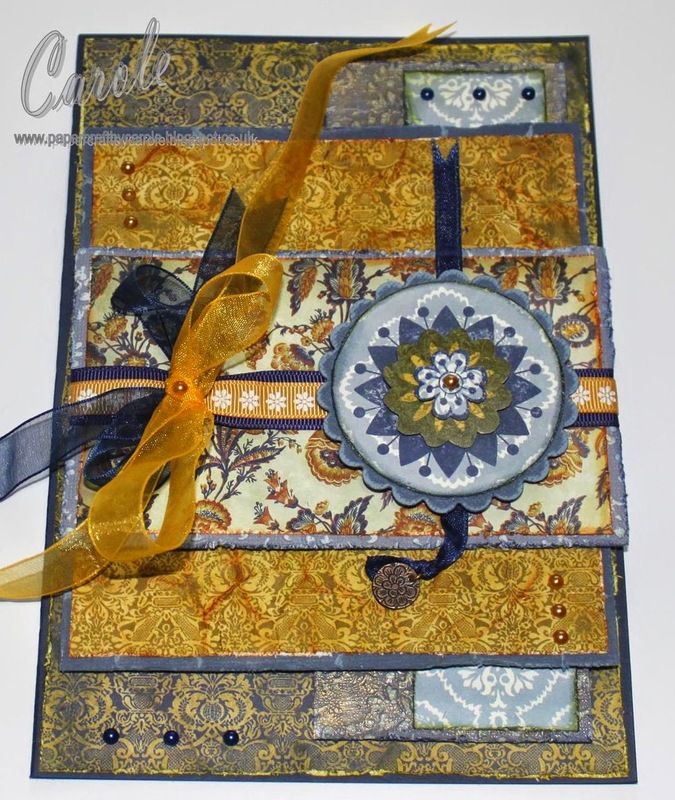 The die cuts used dies from Spellbinders, and the embossing folder is from Crafter's Companion. The sentiment is from an inkless stamp I've had for many years. 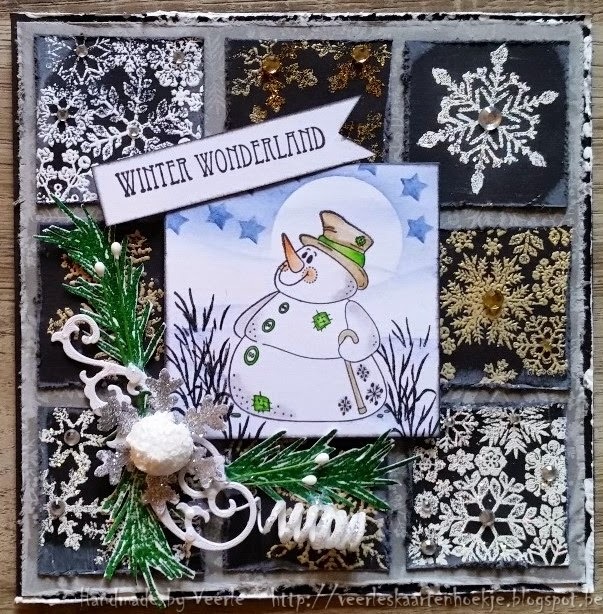 My card is made using some hobbycraft cardstock as a background and highlighting a lovely House of Zandra stamp, coloured with promarkers in a simple mat and layer combination. It's been snowing up here in Canada for a few days now, so I really had a craving to do something extra wintery. 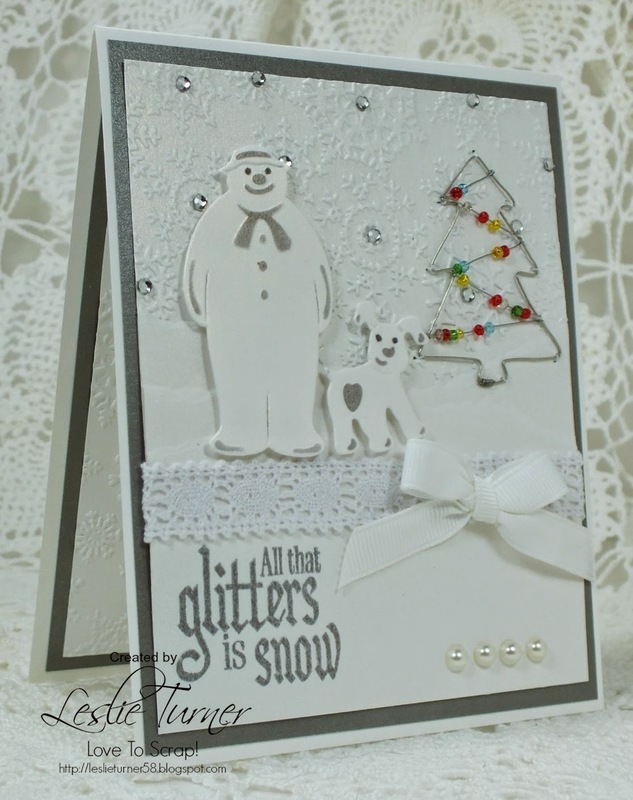 I used lots of fake snow, white glitter, glitter paste and frosty blues to make my winter wonderland Christmas card. 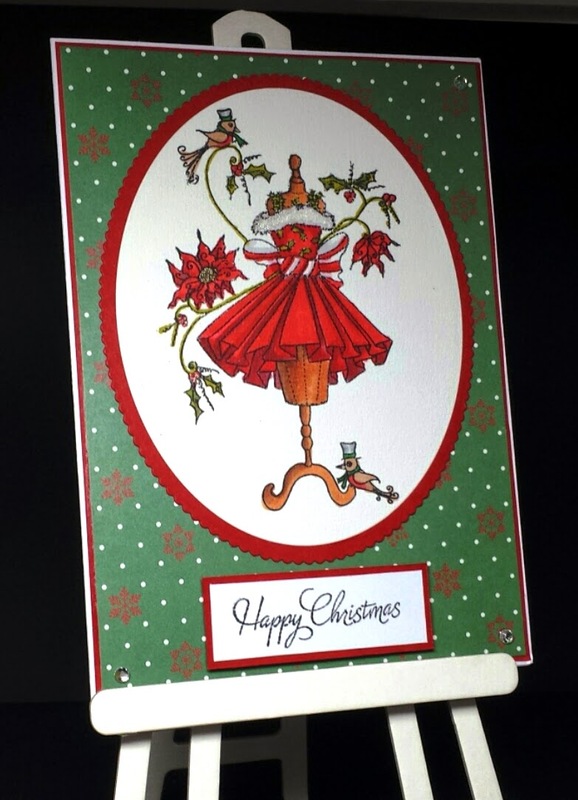 I have used what has turned out to be my favourite Christmas stamp of 2014, this fabulous Woodware Poinsettia designed by my friend Jane Gill. This time I have painted it with Watercolour Pearlex, but there are several other examples over on my blog. Christmas is that time of year when most of us will batch make our cards. I'm no exception - although I do like to make each one slightly different. 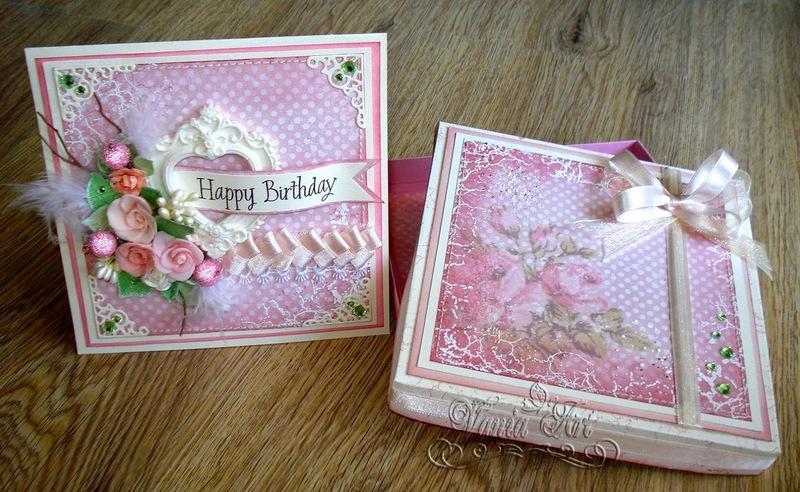 So for these Vintage style cards, the layout is the same - just different papers and embellishments. 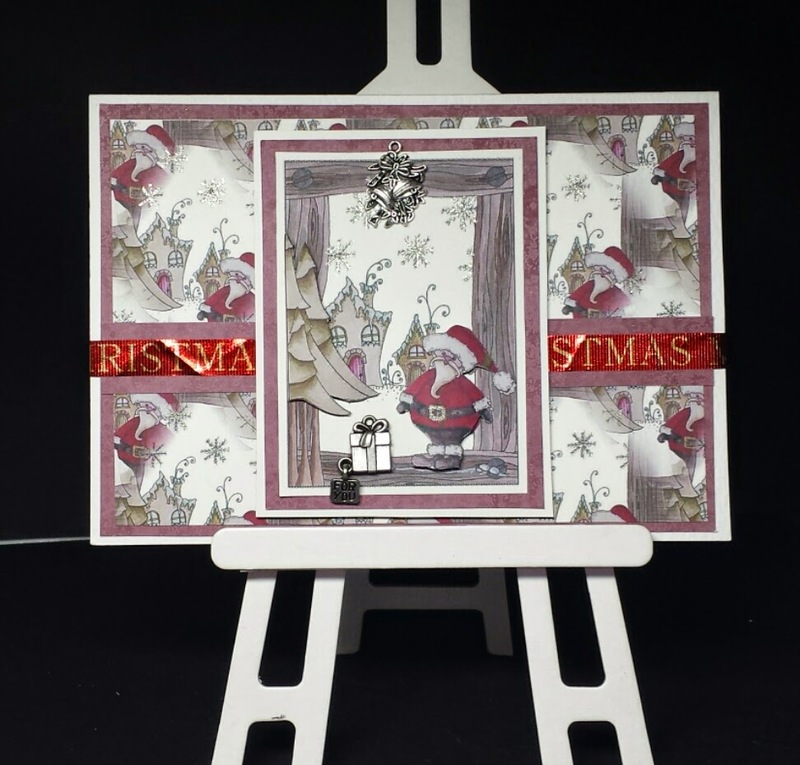 I have stamped onto some wood effect paper and created a frame with embossed paper and dies. 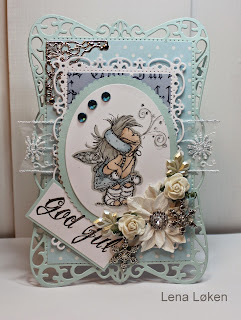 Foliage, flowers, a bow and lots of pearls finish my card. 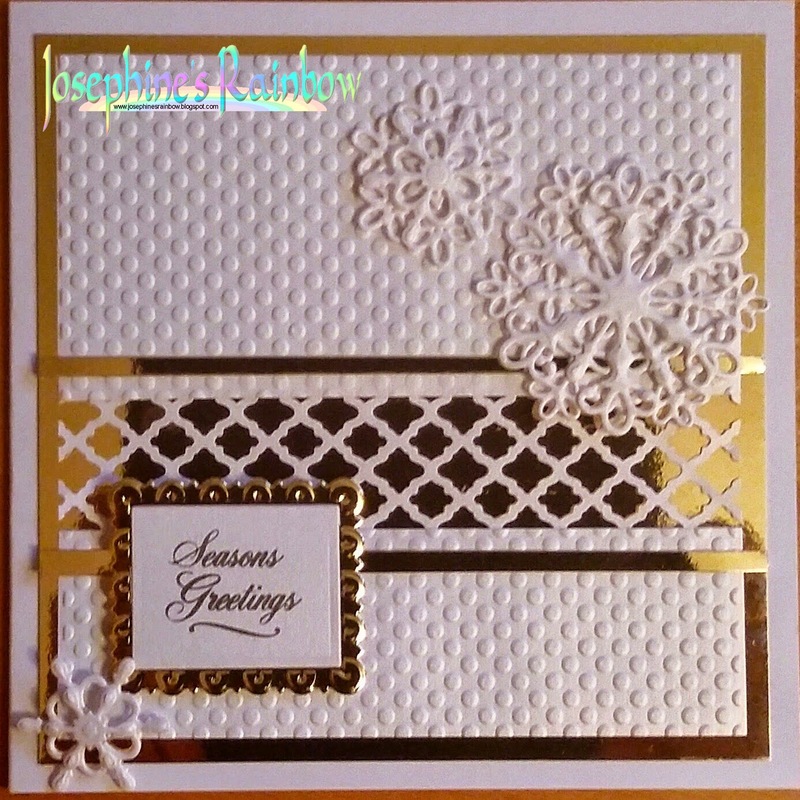 I created a white on white Christmas card using Crafters Companion embossing folder, dies and stamps. 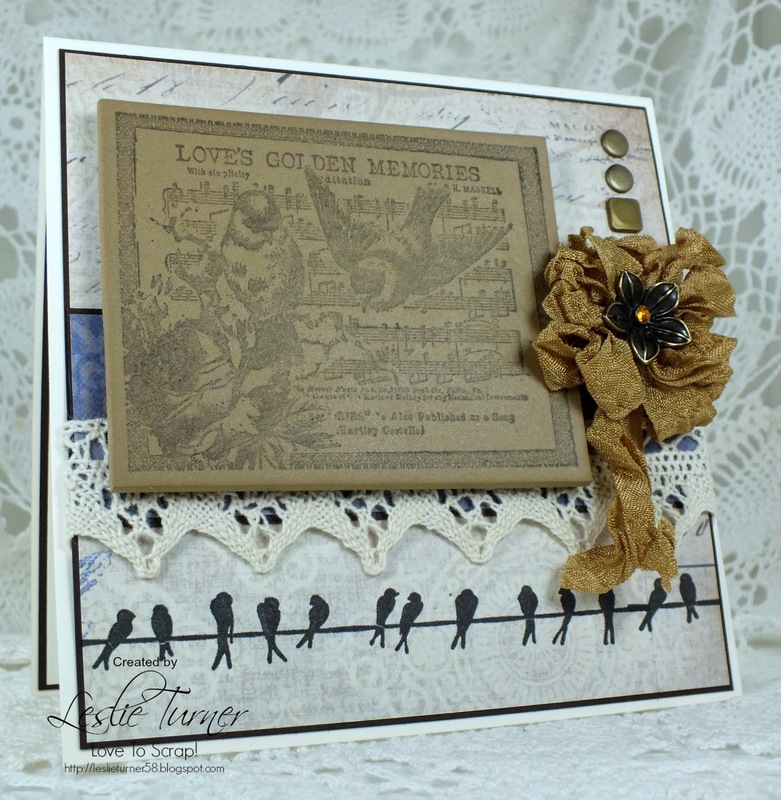 I used gray ink on the die cut characters and sentiments, and matted the background on matching gray shimmer cardstock. There is just a pop of color from the beads on the wire Christmas tree. Any entry that does not meet the challenge requirement or that does not follow our simple rules will be deleted. If you are having issues with any other linking matter please mail me at the address in the side bar. 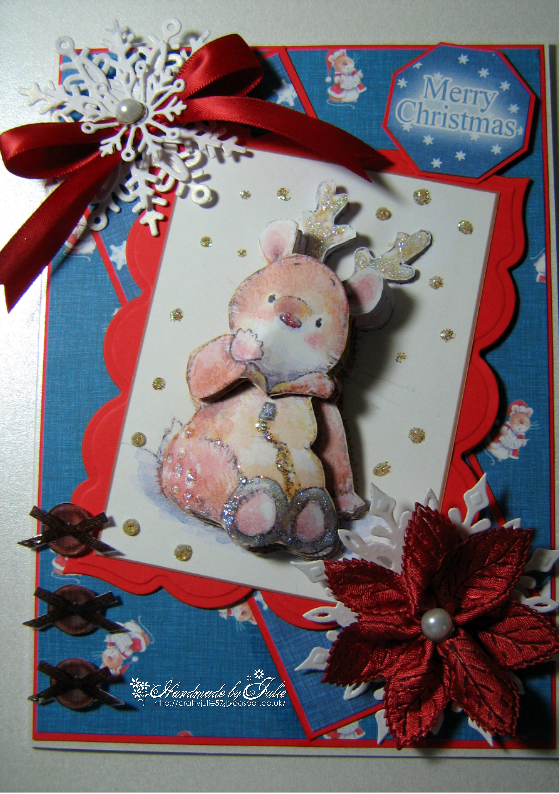 Merry Christmas and a Happy New Year from all at Crafty Cardmakers! 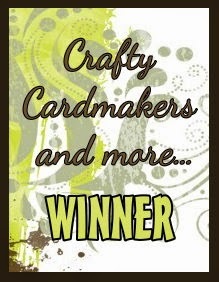 Congratulations to you all, please feel free to display our Winner's or Top 5 badge on your blogs. Would the winners please contact me at the address in the sidebar stating the number of the challenge, the title of the challenge and which prize they have won in the subject line. You have until 21st December to claim your prizes. Lin (me) is hosting our 'Distress It' challenge. I would like to see distressing, preferably lots of it, on your project. 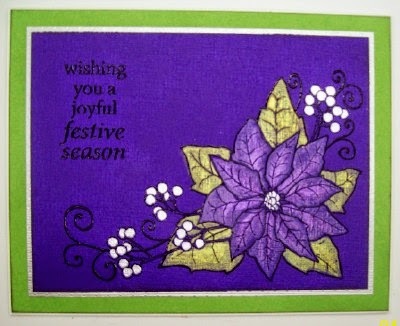 For clarification I do not mean just using distress inks, but distressed edges, frantage, anything a bit shabby looking. I have been drawing since a child and studied graphics at College many years ago, I now work as a Medical photographer part time but my love was always drawing. I started cardmaking about 4yrs ago when I bought my daughter a cardmaking kit which we did together, but I’m afraid I got the bug! My daughter preferred scrapbooking. I then started looking online at other blogs and this then became my passion and I loved sharing my cards with like minded people. I love stamping and loved finding images, but sometimes I could not find what I wanted so I started to draw myself. This then has become my second addiction and I have never looked back, I love thinking of new images, and its just fabulous to see others take them and make them into beautiful works of art. Long may it continue! With a prize of £12.00 to spend at your favourite Woodware Stockist, either in store or on line. 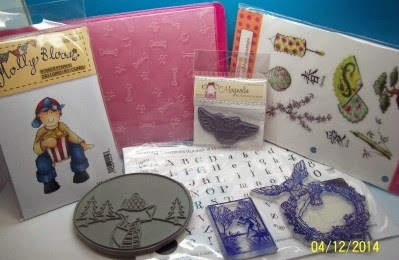 Woodware are a Yorkshire based family owned business, as well as distributing Dreamweaver Stencils and Stampendous Stamps we have a wonderful range of stamps designed for us by Francoise Read and Jane Gill. We also scour the world for new and innovative products for the crafty card maker, and have a great range of punches and tools of the trade, to find stockists in your area or to see the range visit the website www.woodware.co.uk. Our design team are playing along with the challenge so check out our blog, which is there for inspiration at www.woodware.co.uk/blog. 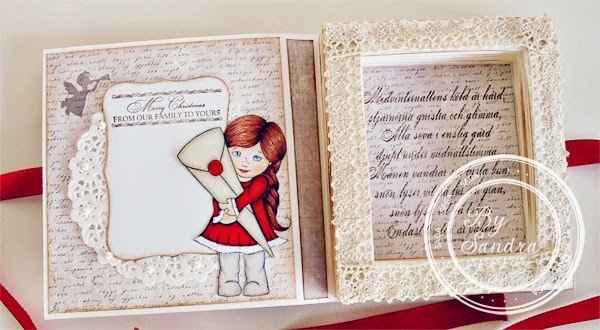 My papers are a combination of Memory Box and Wild Rose Studio. 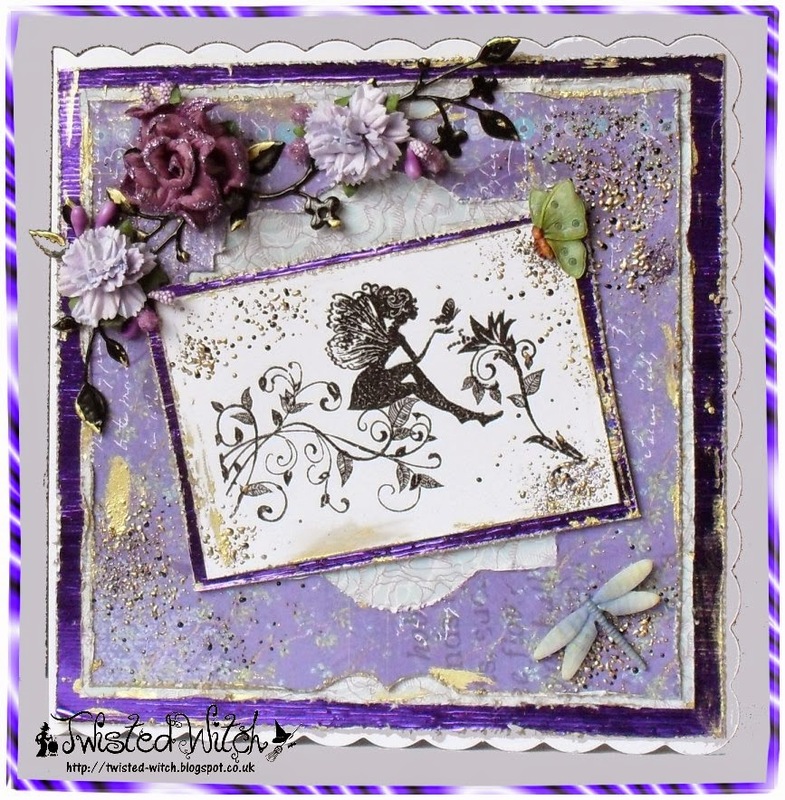 The fairy stamp was a freebie in this month's Card Making and Papercraft. Flowers and resin butterflies from my stash. For my project I have distressed paper edges with my Tim Holtz paper distresser, crumpled paper and inked over it and used Distress Crackle paint with a little gilding wax! Oh - and of course used my Distress Inks!! 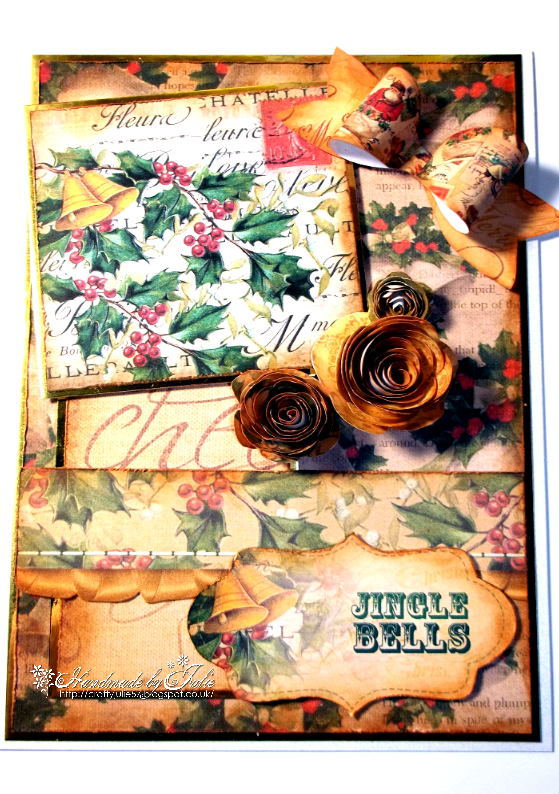 Distressing, for me, goes hand-in-hand with vintage, so for my project I decided to make a Vintage Christmas card with tons of distressed layers and tags. 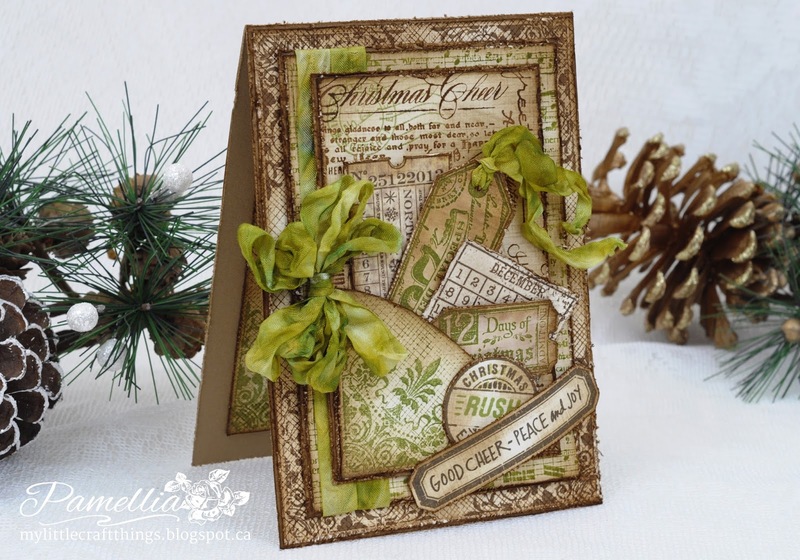 I have used a variety of stamps and some Tim Holtz distress inks, stains and sprays! Distressing everywhere! I don't really do a lot of 'distressing', other than with inks so this was a bit of a challenge for me. 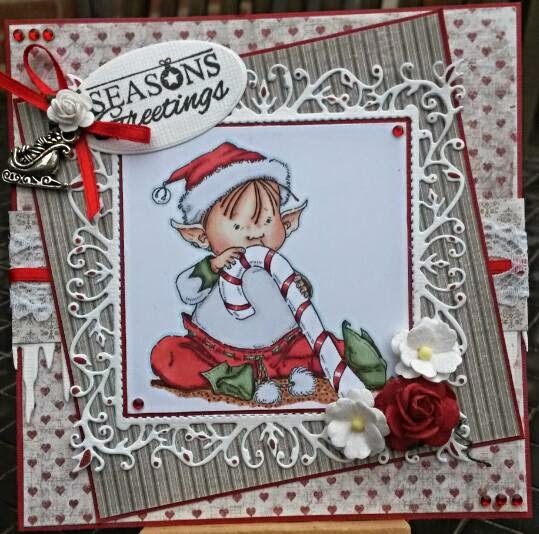 I chose a piece of background that I had created with my Creative Palette and then used a fabulous Poinsettia stamp from our sponsor Woodware. I paper pieced the Poinsettia having 'distressed' it a little first. I have distressed the edges of all the edges and then used distress ink on them, you can't see much of the distressing though in the picture. This was a tricky challenge for me as I'm a clean and simple type of girl. Lol. However I gave it a go and made a Christmas hanging decoration. I used corrugated card, which I partly peeled and painted. 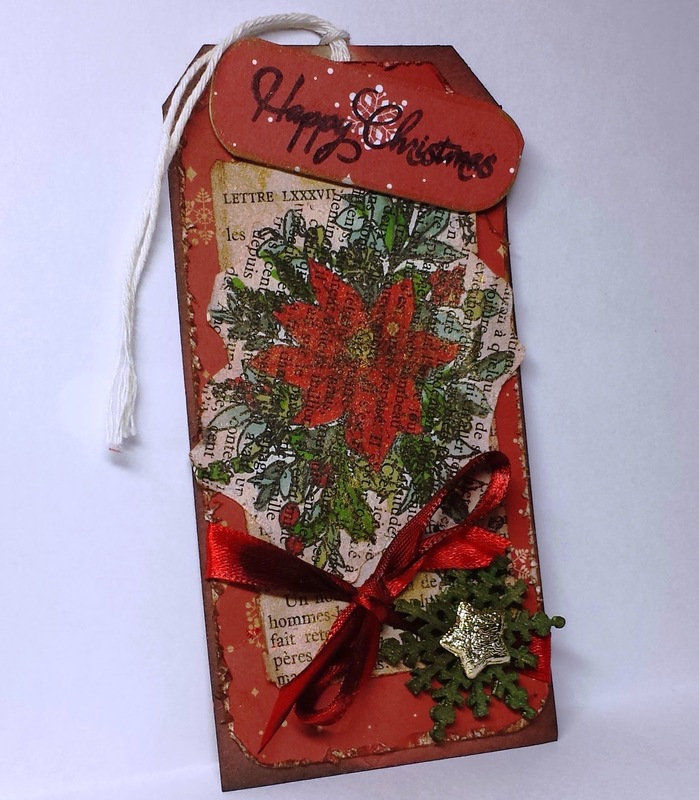 The "25" and reindeer are Tim Holtz dies to which I added stickles and crackle accents. The star is gold miri, distressed with sandpaper. The berries and sequin ribbon are from my stash. 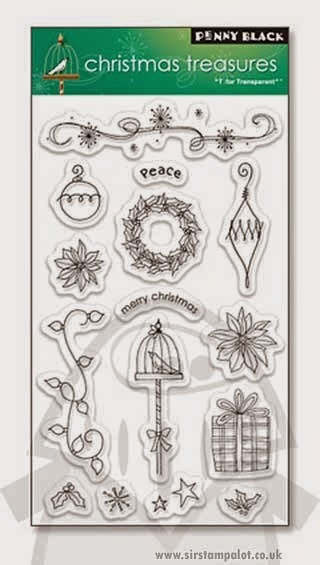 My papers, stamps, and ribbon are all from Gina K Designs. 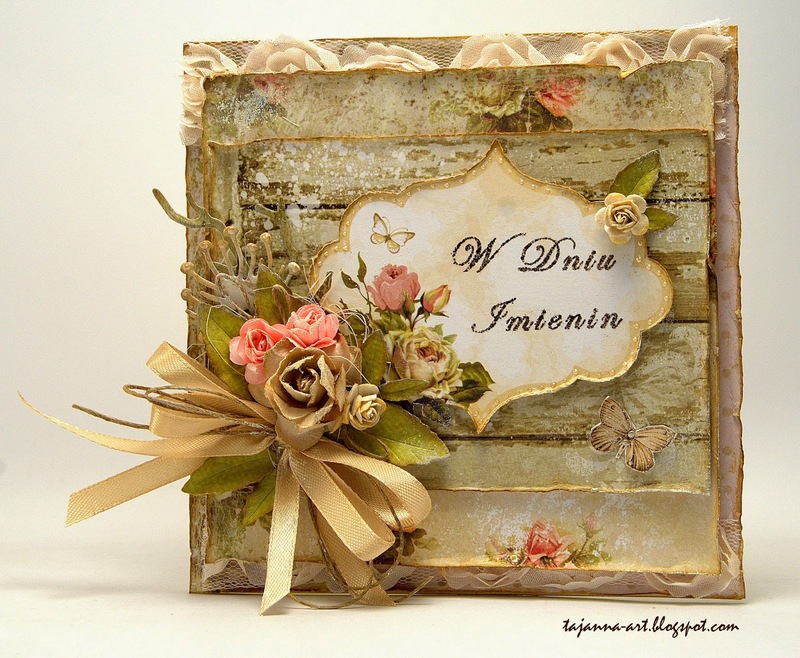 I used the Tim Holtz distressing tool to distress all the edges of the layered background and center panels. 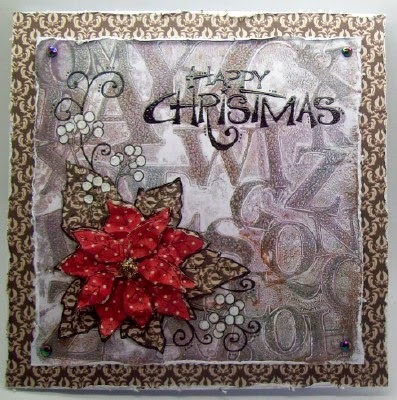 I also stitched the background and center panel, and used some white flat-back pearls and red glitter Gumdrops. Sorry for the delay, it’s just been one of those days! Josephine is hosting today and her theme is 'A Touch of Charm'. She would like to see a charm added to your project. 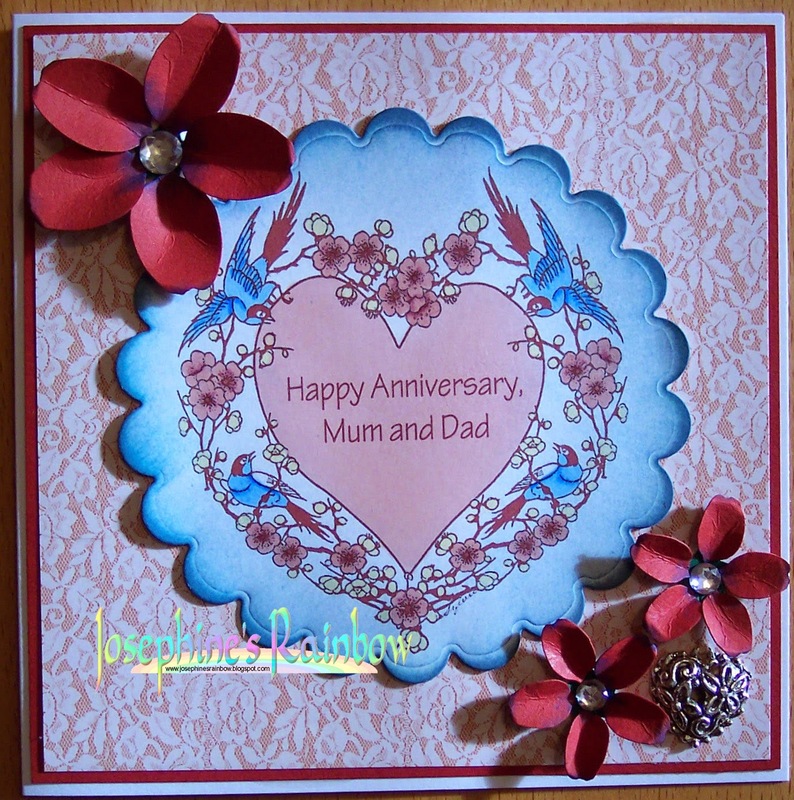 I used an image from The Creative Mind of Sylvie called Heart Blossom, combining it with a digi paper, hand-made flowers and a heart charm to make this card for a friend's parents. I used the Artistic Outpost stamp set called Bluebird. I stamped the large image on the front on Commotion's "Almost Leather" after hitting it with the heat tool. I used round and square brass eyelets, crocheted cotton lace and a flower charm in the center of my big bow. I'm in the middle of panic making Christmas Cards at the moment, and they are perfect for using these cute charms I had in my stash! 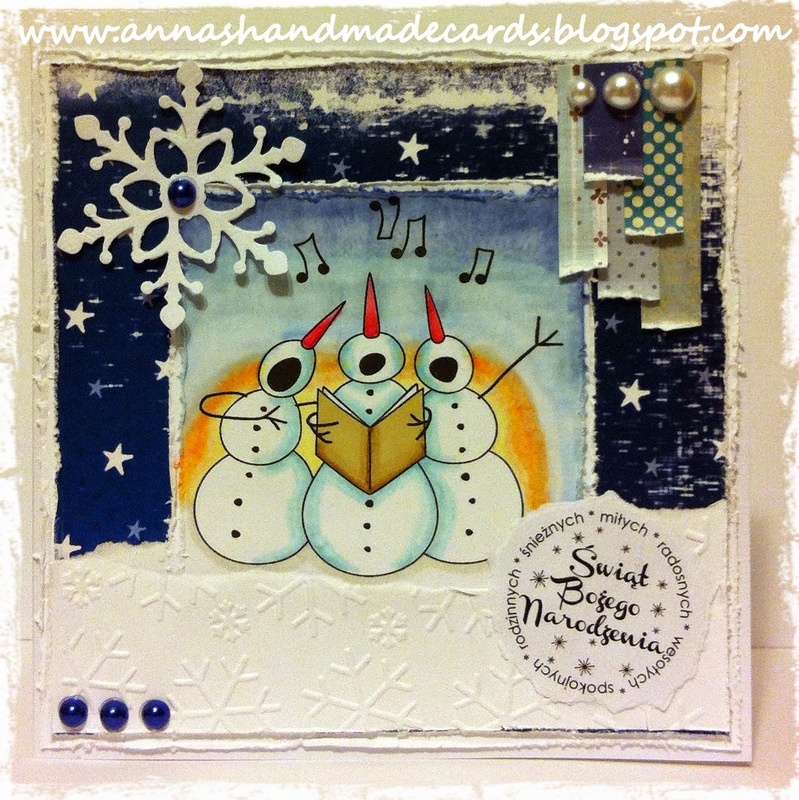 My card also uses some backing papers and images from the Christmas House of Zandra CD which I decoupaged. 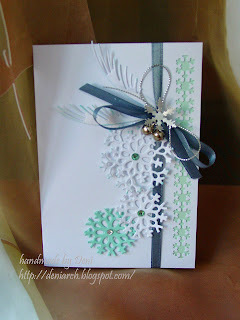 I had a snowflake charm all picked out for this card, then at the last minute I didn't like how it looked. So I decided to make a charm from scratch using some silver embossing powder, silver paint, UTEE, a Lili of the Valley sentiment stamp, some Ranger Archival ink and a Tim Holtz tag die. I used a mannequin stamp from Kaisercraft, some sparkly DP, the flower is cut from cream felt using the Tim Holtz pinecone die and the charm is from my stash. 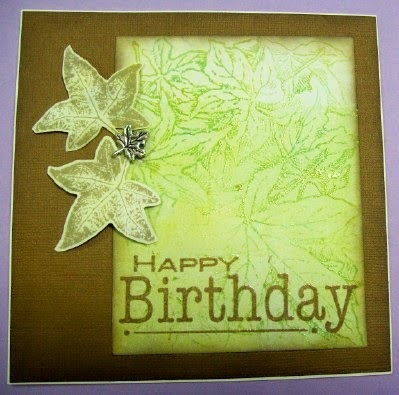 For my card I have used a piece of background made with my Gelli Plate and a fabulous leaf background stamp from Stampendous. I also added a couple of fussy cut leaves, sentiment and a lovely leaf charm. My charm is in the centre of my sunflower. 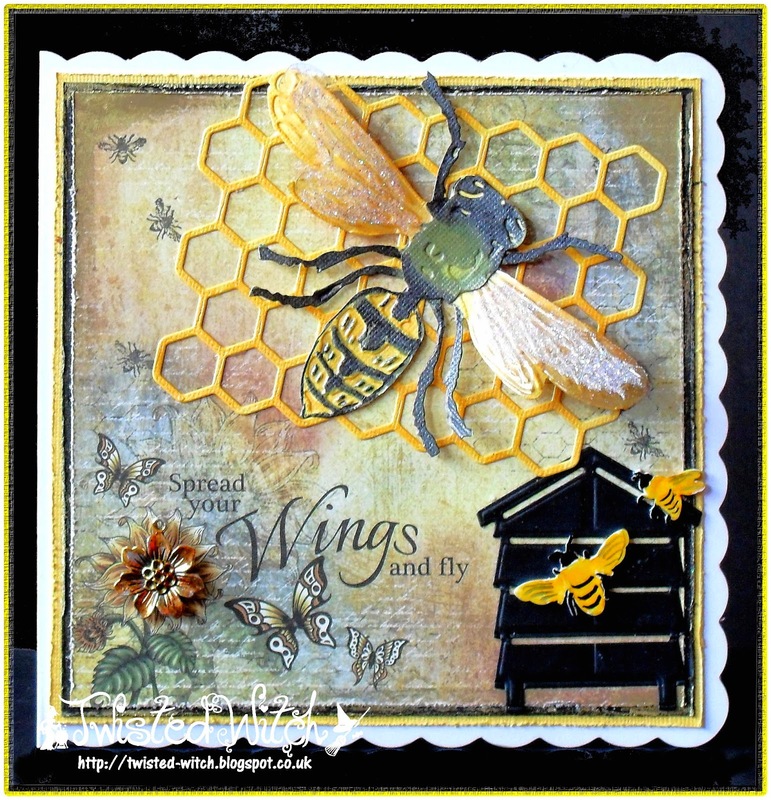 Tim Holtz Layered Bee is the focal point, and Heartfelt Creations Sunflower paper for the background. 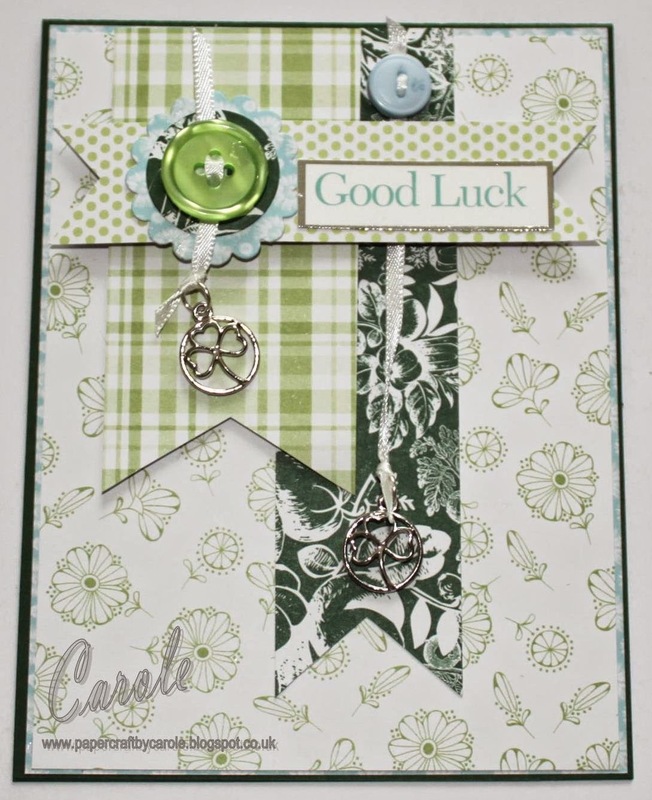 My card is a Good Luck card, inspired by the clover charms I found in my stash. (OK - I know they're not 4-leaved but you get the idea! ).